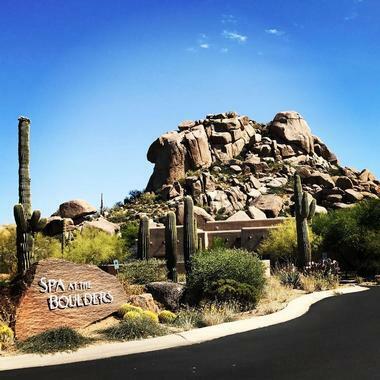 Situated within the Sonoran Desert, Boulders Resort and Spa feature four swimming pools, outdoor recreational activities, and a state-of-the-art spa. Boulders Resort and Spa is ideal for family vacations, getaways with friends, or romantic trips. With a variety of guest rooms, suites, and villas, Boulders Resort and Spa boasts Southwestern décor, up-to-date amenities, and comfortable bedding. Each room contains a fireplace, a high-definition television, and access to a private outdoor balcony or patio. For standard guest rooms, guests can choose from one of the resort’s Casitas. Casitas offer 550 square feet of space. Visitors can choose between a king-sized bed and two double beds. Views of the Boulders and the desert are also available in the Sonoran Casita King Bed and the Boulder Casita King Bed. For more space, guests can also book one of the resort’s Executive Suites. Outfitted with a conference table, a wet bar, and a separate sleeping area, the Executive Suite offers 1100 square feet of space. Guests can enjoy the standalone villa homes that Boulders Resort and Spa offers. Villas include laundry facilities, a full-sized kitchen, and a private driveway. Villas also offer a secluded patio with a grill. Guests can choose between villas with one, two, or three bedrooms. These villas can accommodate 4 to 6 guests. For larger or upgraded facilities, guests can also book the Saguaro Villas, which offer larger living areas and top-of-the-line appliances. With more than 3000 square feet of space, the Haciendas at the Boulder Resort and Spa offer private patios with outdoor fireplaces, a whirlpool tub in the master bath, and a full-sized kitchen. Guests can book two- or three-bedroom haciendas, which can accommodate 5 and 7 guests respectively. Larger groups may choose to book the Villa Retreat. With more than 5700 square feet of space spread out over two villas, the Villa Retreat is the largest living space available at the resort. The Villa Retreat offers six bedrooms, multiple living spaces, and a private pool. The grounds include a private patio, fire pit, sun deck, and yoga studio. 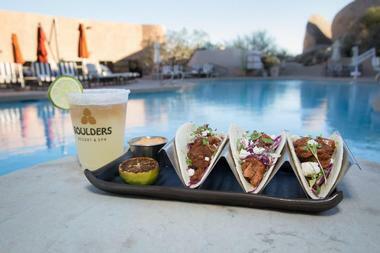 Boulders Resort and Spa feature a slew of dining options for guests to enjoy during their stay. Palo Verde restaurant is open for breakfast and dinner. With views of the Sonoran Desert and the resort’s golf course, Palo Verde offers fresh cuisine with a Southwestern flair. Ranked as one of the best Mexican restaurants in Phoenix, the Spotted Donkey Cantina is open for lunch and dinner. The Spotted Donkey Cantina serves modern Mexican meals, alongside a wide selection of tequila and cocktails. The Grill Kitchen & Bar is open for breakfast and lunch. Guests can enjoy a view of the golf course from the dining room or patio in this casual eatery. The menu includes a selection of sandwiches and salads. Guests can visit the resort’s Spa Café for light meals with a focus on freshness. Vegan, vegetarian, and allergy-sensitive meals are available daily. The Spa Café is open for breakfast and lunch. Poolside beverages and light snacks are also available from the Spa Café. Discovery Lounge is the Boulders Resort’s homey bar. Serving drinks all day from its full-service bar, the Discover Lounge also serves appetizers, sandwiches, salads and desserts during their lunch and dinner service. Guests can relax by the fireplace to enjoy their drinks, or enjoy views of the boulders through the floor-to-ceiling windows. 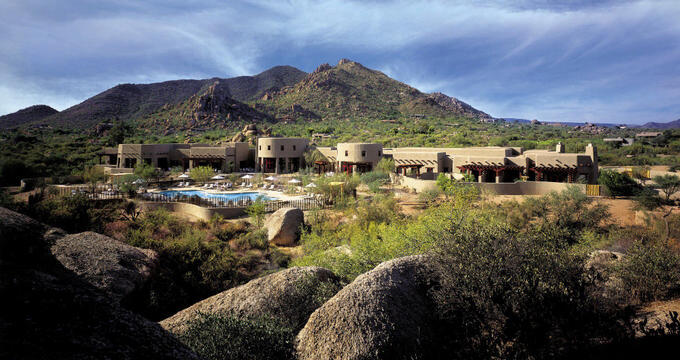 For a day of rest and relaxation, guests can head to the Spa at the Boulders Resort. Visitors can order a variety of massages, body treatments, and facials. Nail services, hair styling, and waxing services are also available at the hotel’s full-service salon. The Spa also offers services such as chakra balancing, astrological soul reading, and emotional balancing that are meant to care for the mind and soul. Within the Spa, guests are also welcome to further the tranquility of their visit by taking part in one of the boulder climbing sessions, guided hikes, or personal fitness classes that are offered. Boulders Resort and Spa has two on-site golf courses. Offering scenic views of the desert, challenging terrain, and instruction by a professional through the Golf Academy at the Boulders, these golf courses offer championship-quality recreation. Boulder Resort and Spa also offers a pro shop with apparel, equipment, and golf cart rentals. Whether an experienced golfer looking to upgrade or a novice hoping to rent a set of clubs, the Golf Shop has something to offer to golfers of all experience levels. Boulders Resort and Spa’s picturesque location and facilities make it ideal for gatherings of any size. Guests looking to book an event at the hotel will have a variety of available spaces from which to choose. Whether looking for a meeting space, classroom, or banquet hall, the hotel offers more than 50,000 square feet of indoor and outdoor space for visitors to rent for corporate retreats and weddings alike. Each facility is outfitted with a variety of technological and audio-visual equipment, and catering from the chefs at The Boulders is available for any event. Available facilities include several ballrooms, boardrooms, and terraces that accommodate groups of all sizes. Couples can also make their wedding-day dreams come true at Boulders Resort and Spa. The hotel offers a range of indoor and outdoor venues that are perfect for weddings of any size and aesthetic. The resort supplies salon packages, culinary services, and ceremony coordination by an on-site wedding planner. 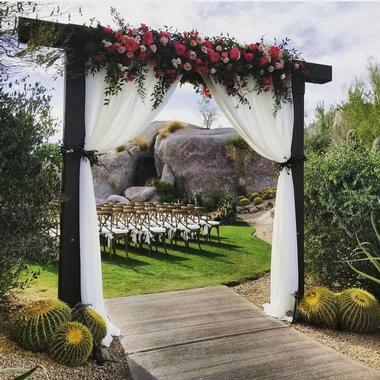 Wedding venues include the Organic Garden, which will accommodate 50 guests, as well as the Latilla Ballroom at the Main Lodge, which can accommodate up to 250 attendees.